Emotional scenes on the Back of the Ferry this evening. Tonight we farewelled one of our founding members – pommy_ch. pommy_ch is heading back to the Old Dart tomorrow. Fortunately pommy_ch’s absence from the Back of the Ferry will be temporary as he will away for only one month. For readers that don’t actually get the ferry, it’ll be like pommy_ch has never left, because he has promised to send a steady flow of tales about beers and bars in the South West of the UK. 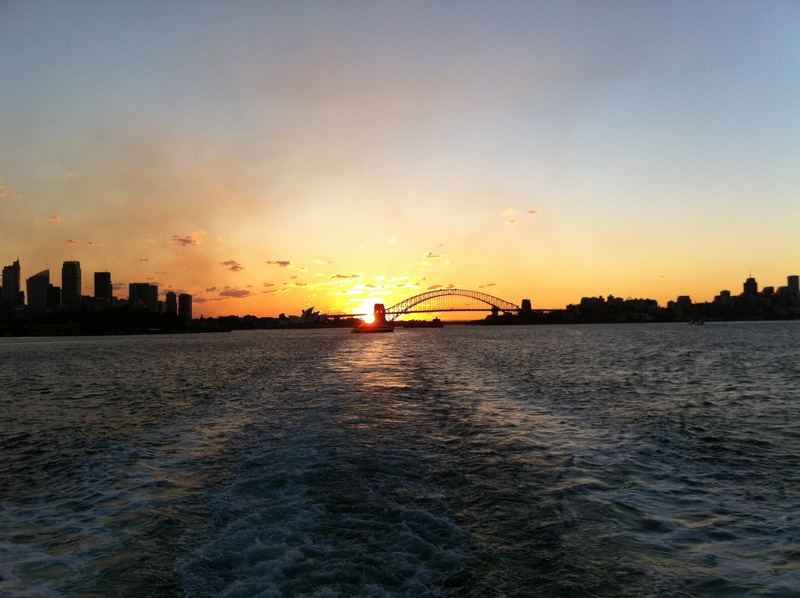 Sydney turned on one of its finest September twilights. The weather was balmy, the sky was speckled with cloud and the ocean was benign as Mother Teresa. 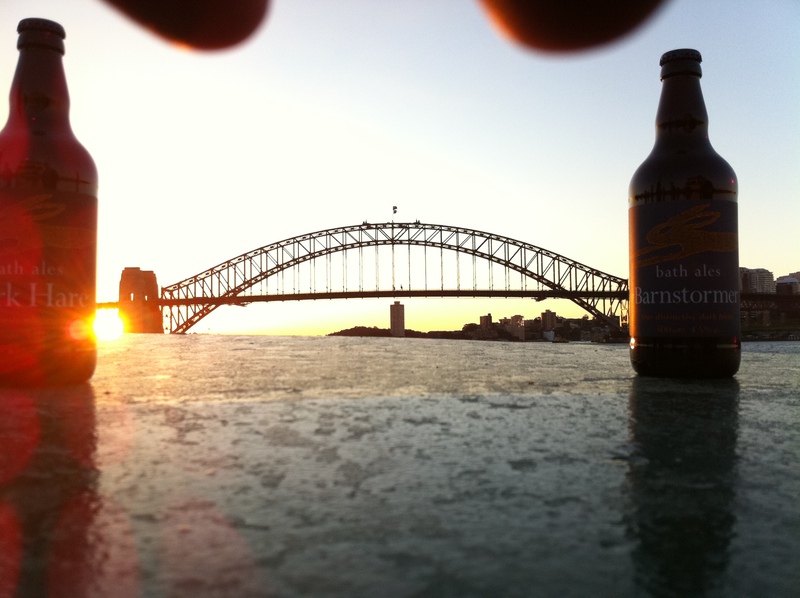 The view of the sun setting behind the Sydney Harbour Bridge as we turned the corner at Bradley’s Head was so memorable that pommy_ch has enough to tide him over during his month’s absence. Our first beer has appeared on these pages before. The Australian Wine Centre in Goldfields House, Circular Quay is stocking some Aussie Craft Beer on its shelves and is a welcome alternative to Mr Liquor. 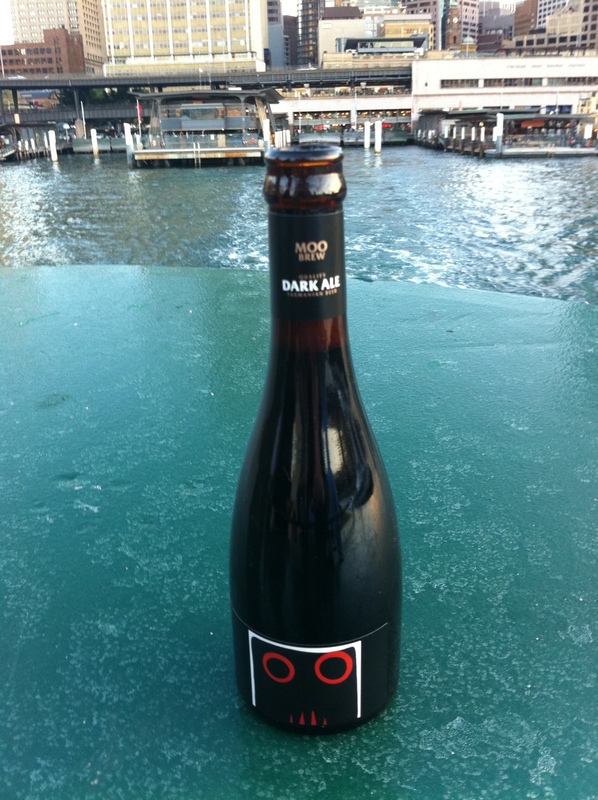 They’ve currently got two varieties of Moo Brew available, and I opted for the Dark Ale. This is a chewy beer, and probably not one for a balmy evening, but rather a cold Tasmanian night. Still, nothing to sneeze at. The real treat was what pommy_ch had brought along to commemorate his final voyage for a month. When pommy_ch returned from his last trip he had his bags full of Bath Ales. We’ve already enjoyed Gem and Wild Hare, and they received the full Back of the Ferry Beerporn treatment. 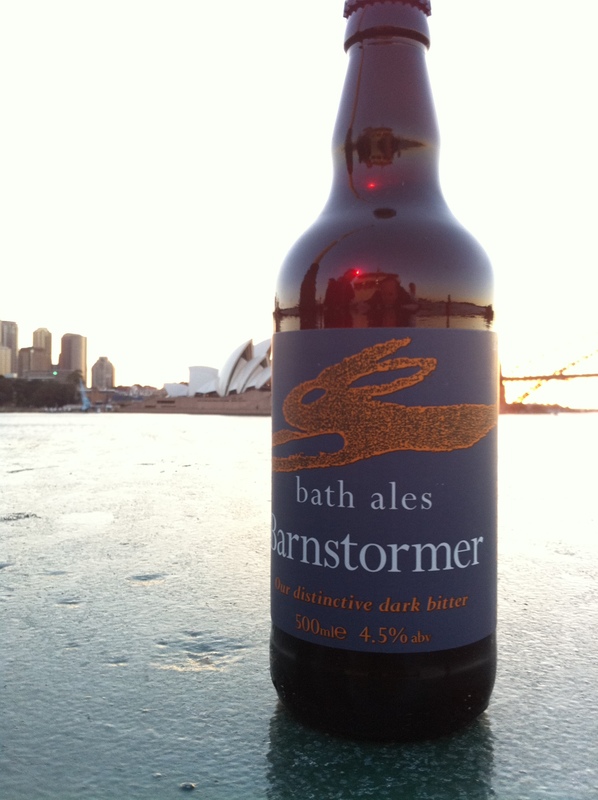 Tonight we turned to Bath Ales’ dark side and had were accompanied on our journey by Barnstormer and Dark Hare. To be honest we’ve had better photographic moments, but the Barnstormer still looks pretty good next to the Opera House. We knocked the top off the Barnstormer, but the Dark Hare will be stored in case Sydney has another cold turn. Barnstormer is classed as a “Distinctive Dark Bitter”. Wow – this is a fine beer. Smooth, understated but plenty of flavour. I’m looking forward to having it in a glass, as it colour looks awesome and I’d like to have a sniff of it more as I drink it. Plenty of malt in the flavour and it wasn’t as bitter as the name suggested. A really balanced drop. pommy_ch will get to have plenty of this on tap – and we look forward to the reports. Bon voyage, pommy_ch.